Car Bike Rack. Photo via Cyclehoop. A version of this post was originally published by Mariana Gil in Portuegese on TheCityFix Brasil on July 13, 2011. How many bikes can you fit in the space occupied by a single car? Never thought about it? 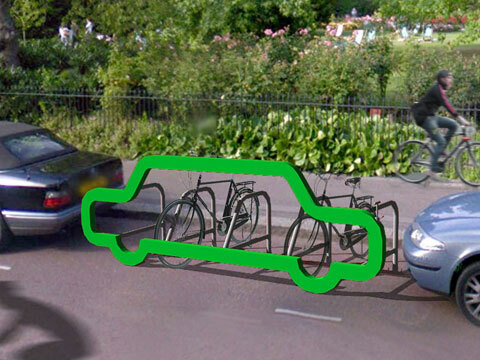 The creators of Car Bike Rack, CycleHoop, did and they developed a car-shaped bike rack to prove the point. 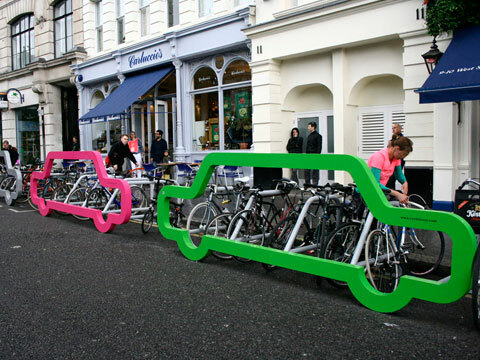 Originally commissioned by the London Festival of Architecture, the bright-colored bike racks raise awareness and encourage the use of non-motorized transport by converting car parking spaces into parking docks for 10 bicycles. Besides the functional purpose they serve cyclists, the car-shaped racks convey a serious message in a humorous way, explained the British company. The structure also works to shield cyclists by creating a protective barrier between flowing traffic and the parked bicycles. Since its commission, the bike racks have been installed around the UK and in several cities across Europe. The bike rack is easy to assemble and ideal for events, especially those promoting cycling. Although originally designed for temporary installations, the structure can also be bolted down for permanent use. Learn more about Car Bike Rack here. Besides the Car Bike Rack, CycleHoop provides many other products and services in bicycle parking design. Learn more about the company here.